For 2009, the IS 250 gets a few styling changes and settings tweaks. For anyone well versed in the IS lineup then, relatively little has changed. But then again, why mess with a winning formula? The IS 250 is a comfortable, almost cosseting entry-level luxury sedan, the kind of place where the proposition of sitting still for several hours doesn’t bring to mind fears of sore backsides and numb legs. 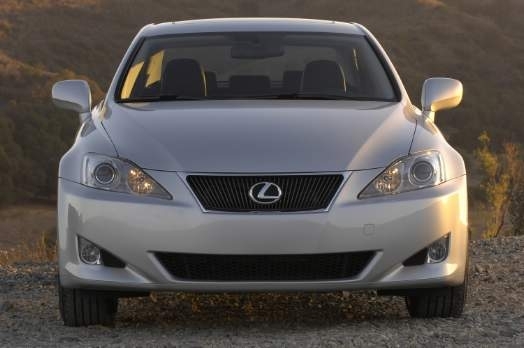 As a sports sedan, the IS 250 AWD is held down by its lackluster engine, soft suspension and heavy all-wheel drive system, but for 2009 Lexus has introduced a lineup of F-Sport Performance Accessories for drivers keen on getting a bit more out of their car. In all honesty the performance parts don’t make as much sense on the automatic-only IS 250 AWD, but we think the addition of a sports suspension, short-shift kit and exhaust to a manual transmission rear-wheel drive model would smooth out some of the drive issues and create a better overall package. Inside, the IS 250 is pure comfort thanks to incredibly soft seats, decent ergonomics and luxurious leather trimmings. Exterior and interior stylings are both unique and charming, without going too far. All-wheel drive system adds versatility to the package. A few more horsepower wouldn’t go unnoticed. You’ll have to dig around a bit before you’re able to fully wrap your head around the climate controls, as temperature functions are operated by console-mounted buttons, but vent and fan controls are hidden within the navigation screen. Rear seat is a bit of a squeeze for most. Overall, the IS 250 AWD is generally a comfortable, quiet place to be. The 2.5-liter V-6 engine is no screamer and feels just adequate given the extra bulk of the car’s all-wheel drive system, but as long as the revs are kept high it does its job. Paddle shifters come standard for those who like selecting gears, but the system merely limits the highest gear the car will shift into, meaning if you stomp on the throttle in manual mode the car still has a tendency to downshift. Steering isn’t nearly as finicky and turns the car in cleanly and directly, although there is a minimal amount of on-center deadness. 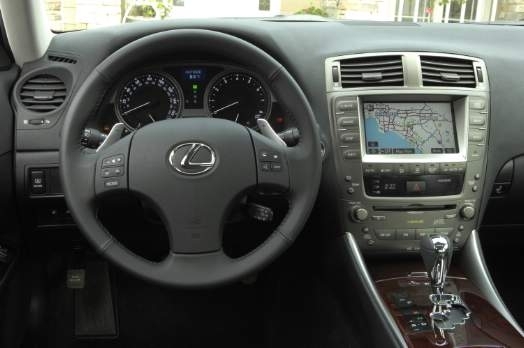 We would recommend ordering the car with radar cruise control, satellite radio and premium sound so you relax on long trips in its luxurious cabin. 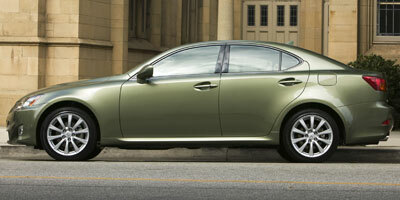 The IS 250 AWD is powered by a 2.5-liter, quad cam V-6 engine that makes 204 horsepower and 185 lb-ft of torque. Power is driven to all four wheels via a six-speed automatic gearbox. Keyless start/stop is standard, which at first seems a bit on the silly side but trust us, you’ll love the convenience. The steering wheel both tilts and telescopes, so taller drivers need not fear an uncomfortable experience behind the wheel. 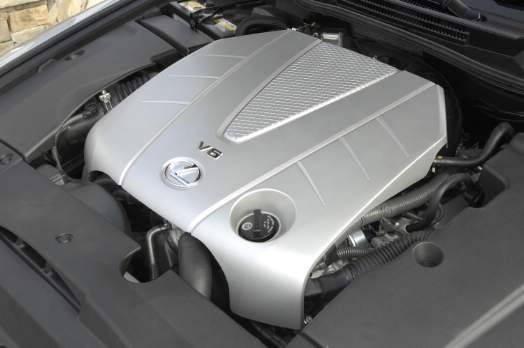 Lexus recently introduced its F-Sport performance parts to the IS range. Up for grabs are add-ons such as high performance brakes, sport-tuned springs, shocks and sway bars, wide 19-inch wheels offering tons of grip, a cold air intake and sports exhaust. Get in the car with your favorite ‘80s power ballad, crank up the sound and…wow. The stock sound system boasts excellent quality and volume, and there’s a 14-speaker Mark Levinson system for those who are left wanting for more. 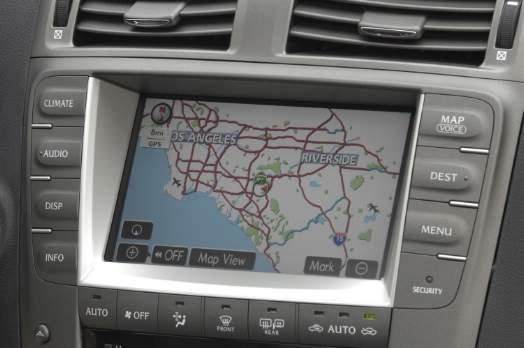 The navigation system is both easy to read and use (you’d be surprised how often that’s not the case) and nav package also includes a rear camera and Bluetooth. Thanks to the mass of the all-wheel drive system, fuel economy isn’t as high as that of the 21/29 mpg offered by the rear-drive IS 250. Still, at 20 mpg city, 26 mpg highway the all-wheel drive model remains solidly economical. It also achieves a ULEV-II emissions rating. You’d expect the interior of a Lexus to be the headline act, and the IS doesn’t disappoint. While it has a somewhat blank dash, the clear, clean electroluminescent gauges with blue information screens look like something straight out of Star Trek, and the ultra-soft leather on the doors and power seats feels like a bargain in this price range. The pointy front-end of the IS takes on a slightly more bubble-shaped form from the side, but overall it’s an attractive package. Beginning at the front fender, the car’s high waistline continues past the C-pillars and through to the rear deck lid, while 18-inch sport alloys give it a more sinister look over the standard items. With an MSRP of $34,935, the all-wheel drive IS commands a $2,460 premium over a standard rear-drive model. Its main competitors are the $35,600 BMW 328i xDrive Sedan, $33,050 Audi A4 2.0T Quattro, $36,450 Mercedes-Benz C300 4Matic and $35,750 Infiniti G37x. While the IS 250 AWD may not be quite as entertaining to drive as some other cars in the segment, the comfortable cabin and copious standard features go a long way to making up for any dynamic shortcomings. The added stability and versatility offered by the all-wheel drive system is a plus, but if you don’t need it save yourself the $2,460 and pick up a standard model.